It’s in our slogan, it’s what we offer and we what we want our clients to take away from their experience with us: moments. Since Choir Nation started holding events at our clients’ offices, music venues and hospital atriums, we have had moments that I will remember and cherish. This is a list of the moments that really stand out for me in the past year or so. 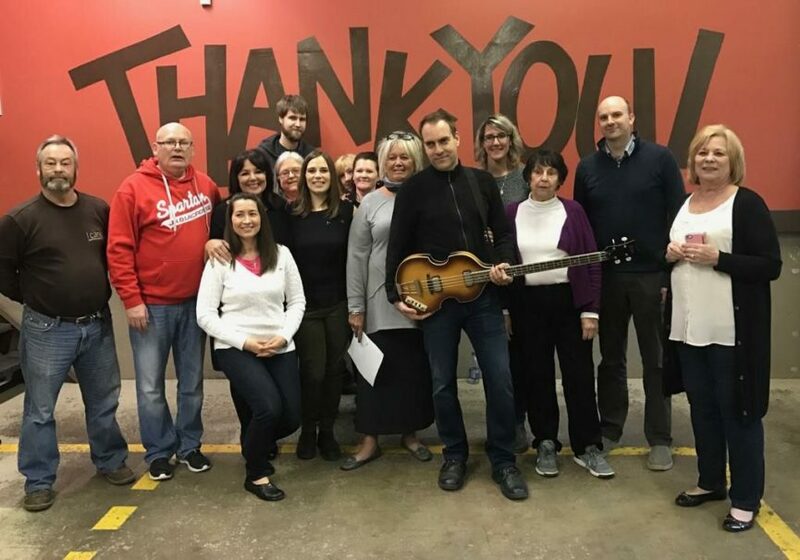 During our First Rehearsal for our first annual benefit show, a group of about 15 employees from Chubb Insurance in Toronto were working on their songs with our music director, Alex Samaras . One particular employee, who I think might have been politely coerced by his friend to join the choir, was kind of struggling. Alex calmly walked over and told him to sing “low, middle, high” at a corresponding pitch, and voila, within minutes he could sing in tune. It was a bit magical – someone who couldn’t sing in tune two minutes before was suddenly singing perfectly. Everyone clapped, high-fived and hugged him to celebrate. Right then, I knew we had something great here. We had a really successful night of music with Katey Gatta kicking off the proceedings, followed by an amazing set by Momentum Choir. Our two company choirs from KPMG Canada and Chubb Insurance really stepped up to the challenge and did a wonderful job singing with Devin Cuddy and Harrow Fair. Our artists also put on incredible sets of music, the silent auction items were huge draws. But then…the moment happened. Momentum, Chubb, and KPMG joined Devin and Miranda in a great rendition of Hey Jude and brought the house down. In the last little while, we launched a weekly drop-in choir in Niagara-on-the-Lake run by Sarah Jerrom. In the first week, a woman walked in and said “Hi, I’m Kelly and I don’t know any of you but I wanted to try something new this out that is out of my comfort zone this year.” The group in Niagara has become very close and have bonded over the engaging sessions by Sarah with a lot of teaching and learning taking place. Not only that, but for many of us, we made our live music debut when we headed over to Silversmith Brewing Company and performed the song we learned that night. It has now become somewhat of a tradition with our new friends at Silversmith looking forward to our weekly performance. Our most recent moment happened just a week ago at Community Care of St Catharines & Thorold Murray and Sarah led a group of awesome employees through a rendition of the Beatles’ classic Come Together. Murray brought his vintage bass guitar that Sir Paul would be proud of and played the iconic bass line. There was just this look of amazement on the faces of the employees. Sarah and I both forgot to introduce Murray to the crowd because of the cool vibe of the moment. Oops! We can’t wait to make more of these moments happen with you. Thanks for reading!